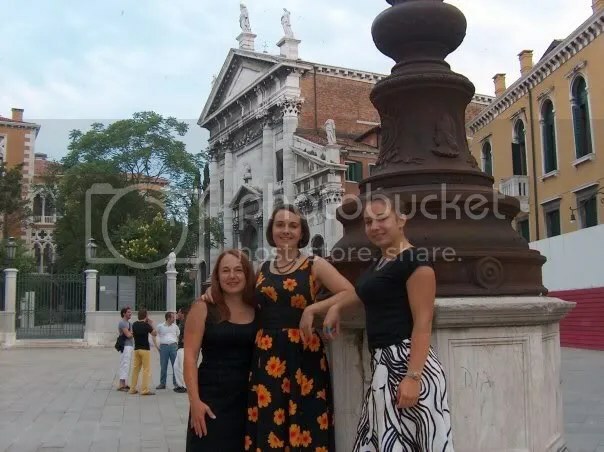 Date and Location: Photograph taken in Venice in 2006. Dress is from Ukraine, 1997. Q. Tell me about what you’re wearing in this photograph? A. I call that my “Ukraine Dress.” It is my favorite dress, the best I’ve ever had. I was sixteen years old and spending a year as a student in Ukraine. The city had one fabric store. I saved up my stipend and bought seven yards of this fabric, I liked the vivid orange and red flowers against the black. It reminded me of fire. My host mother took me to her dressmaker. The dressmaker was a crotchety old woman who didn’t do quite what I asked for, but I’m glad she didn’t, because what she made was better than what I designed. I wanted a romantic dress, with a fitted bodice and floor-length circle skirt. The whole thing was kind of accidental. I didn’t know anything about fabric then, I just liked the print, but the fabric turned out to be fantastic. Some sort of polyester that ripples and never wrinkles. It’s the ultimate traveling dress, which is why you see me wearing it in that photograph from Venice last year. The first day I wore it, a photographer approached me on the street. With my limited understanding of Ukrainian, I misunderstood and was flattered and agreed to pose for him. Really, he just wanted to sell me prints, but they did turn out lovely and one was published in the local paper. That sort of dress really wasn’t fashionable in the late ’90s OR in Ukraine, so I stood out, but I always liked the attention. It’s the sort of dress you see from a block away.